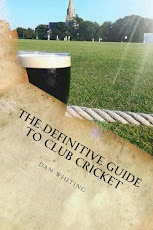 On Thursday 27th September, Dan Whiting and Liam Kenna, the boys behind the Middle Stump will be on www.testmatchsofa.com. Click on the link, or on their logo to the right of this and you can listen to their dulcet tones from around 10.45am for New Zealand v Sri Lanka, followed by England v West Indies at 3pm. We'll try not to swear...much!